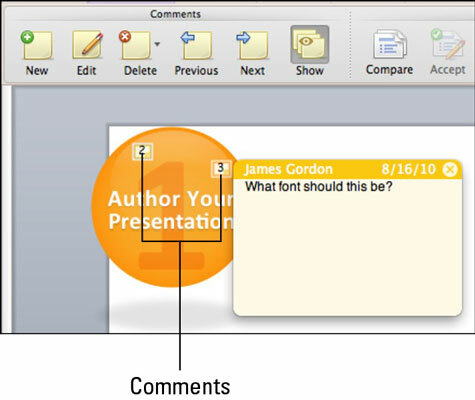 PowerPoint 2011 for Mac has commenting tools that help you communicate with others as you all collaborate on a presentation. The Comments group on the Review tab of the Office 2011 Ribbon lets you communicate to your collaborator (or yourself for that matter) without disturbing the content of your slides. Comment boxes are text boxes that float above the presentation in Normal view. Each box has its own number. When you show comment numbers, you can choose a comment by clicking its number to reveal its contents. New: Inserts an empty comment text box and its corresponding comment number indicator. Edit Comment: You can choose an indicator and then click this button to edit the comment. Delete Comment: Deletes the selected comment. Previous Comment: When more than one comment is in a presentation, displays to the next lowest comment number. Next Comment: When more than one comment is in a presentation, advances to the next highest comment number. Show: Toggles the visibility of comments on and off. PowerPoint’s commenting feature isn’t as elaborate as Word and Excel’s. There are no fancy balloons, nor can you print or format comment boxes. Despite the limitations, having the ability to insert comments is still handy when you’re sharing a PowerPoint slideshow between you and at least one partner.